Trading card games can be a little daunting to play for those unfamiliar with the genre. They’re often quite focused on a complex set of interactions between flexible rules, where victory or defeat is decided by the mechanical interactions of the hundreds of potential playable cards that populate each matchup. While Artifact starts off with a few tutorials that do a reasonable job at educating you on the fundamentals, there’s a lot more at work in each match than the tutorials can cover. It will take some time and experience to fully grasp the importance of some of the various mechanics at work, but there are a few key factors you should be aware of from the start if you want to stand a chance at scoring a win. One of the most downplayed systems is the initiative order, which determines who goes first in each round. By default, this is decided by giving initiative to the first person to claim it by selecting to end their turn. After this is done, the turn will pass to the opposite player, who can continue to play extra cards until both players select to end the round, at which point the combat phase begins and the initiative is given to the person who first claimed it. This can be an extremely important decision to make when deciding what to do next, as having the first turn when the next lane becomes active gives you the opportunity to play first, which might just win the lane depending on the cards in your hand. For example, If you’re happy with the way things are going in the first lane but your second lane is struggling, you might choose to end your turn first and grab the initiative. 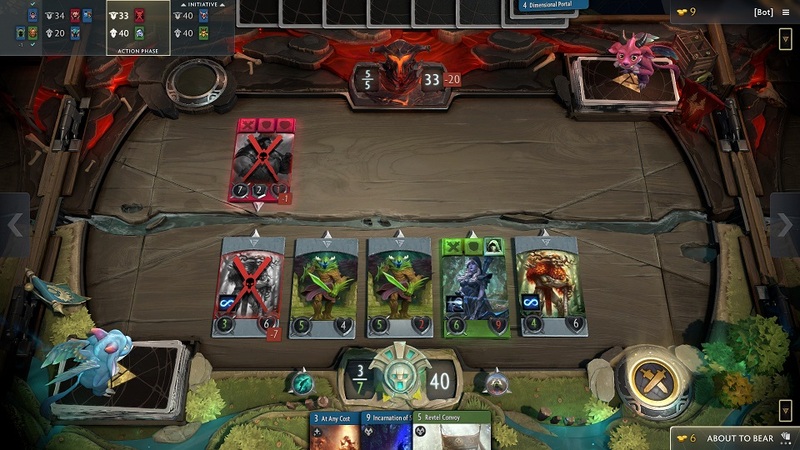 That allows you the first turn in the second lane where you could then use a powerful controlling spell card like Drow Ranger’s Gust skill to silence the entire enemy lineup in that lane, potentially making sure they are unable to play any cards for the remainder of that round. Tower improvements can serve any number of purposes ranging from passive utility and buff effects, to some active actions that can attack enemy units or even fully restore your tower’s mana pool each round. While there’s a lot of different improvements to choose from across each of the deck colors, this type of card is still often underestimated as it usually has to be paired with a specific deck composition or strategy in order to make full use of its function. Fortunately, tower improvements are quite cheap cards to play, usually costing between three and five mana, and they come with the added benefit of being useable across all three lanes, meaning that if you have a hero that can play an improvement in the third lane, you could place that improvement into the first lane and have it come into effect almost immediately during the start of the next round. Tower improvements can also work simultaneously in the same lane with other tower improvements, and there’s no limit to how many you can place into a single lane. 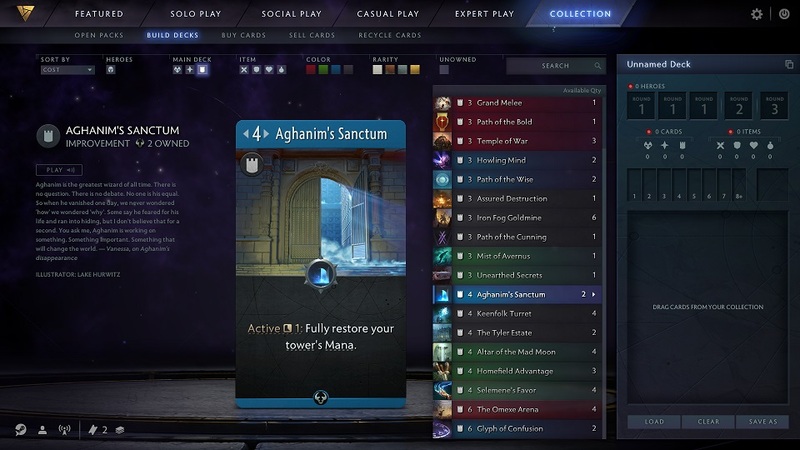 A good example of clever tower improvement use is with the card Aghanim’s Sanctum, a Blue card that allows you to restore your tower’s mana to full as an action each round. This card has incredible synergy with decks that are quite mana intensive as it allows you to stretch your usual resources further. If you were to add a second or third Aghanim’s Sanctum onto the same tower, then that potential becomes even bigger. When used on a deck including units like Sniper and Zeus that have high cost signature cards, this resource manipulation can not only turn the tide of each lane, but it can also let you shut down your opponent entirely. The siege damage type in Artifact isn’t explained very well, and a lot of people aren’t aware of what it actually does for the hero or unit that has it. To put it simply, any unit that has a siege modifier that is also currently blocked by an enemy unit this round will deal the siege damage to the enemy tower as well. So if a unit has two attack and four siege, they attack any opposing units for two damage and the enemy tower will take four damage this round too. However, this damage does not stack if the unit is not blocked by an enemy unit, meaning that if that same unit was to attack the tower head on, they would only deal two damage, and not the combined damage from both the usual attack value and the siege modifier. If you’re looking to build a deck around siege damage then you would be wise to make sure it includes a few Black deck heroes as the Black cards contain a number of useful cards that let you temporarily and permanently modify certain units with siege, allowing you to slowly whittle away at the enemy tower while dealing with any enemy units in the process. 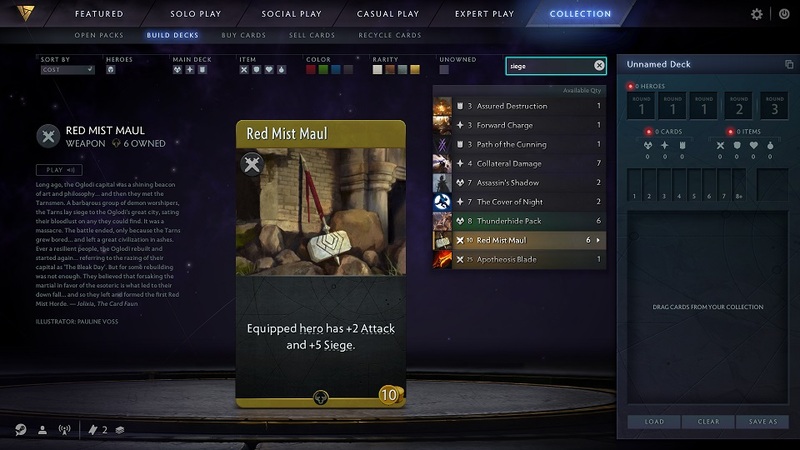 If you aren’t planning on using the Black deck in your build but still want to add some siege damage into the mix, then make sure you take some Red Mist Maul item cards with you as these allow you to equip a hero with two extra attack and five siege. The Red Mist Maul makes a perfect companion to any tanky Red heroes that are holding lanes by themselves as it allows them to hold the line while sneaking in a bit of damage to the enemy tower in the process. 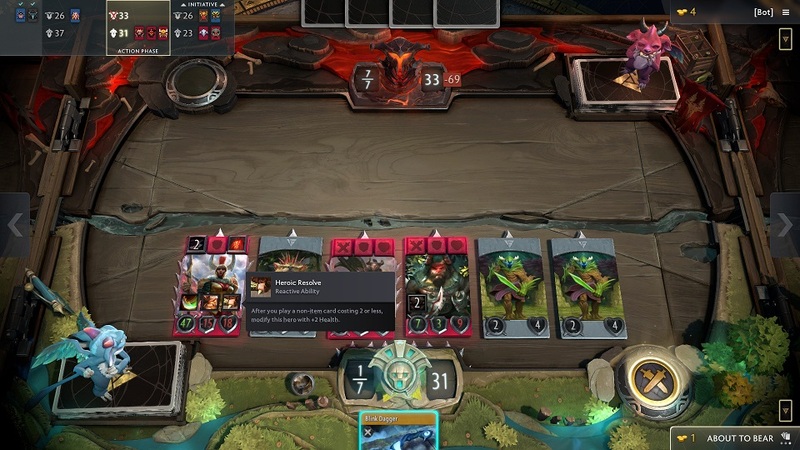 There’s a reason the Red hero Axe is the most expensive hero card on the market right now; with a whopping seven attack, two armor, and eleven health starting stat pool, Axe can easily dominate a lane if he isn’t countered properly. With his initial attributes, Axe can kill over half of the current hero roster in the first turn while reducing any normal damage he takes in the process, making him a force to be reckoned with. Any deck that employs this red menace usually aims to dominate the early game, creating space for the rest of their deck to buff up and win the other two lanes while their opponent struggles to contest Axe. To counter this in the early stages of the match you should try to block Axe as much as possible with your own creeps. By utilizing low cost creep cards, you can reliably soak up Axe’s damage pool at the expense of feeding your opponent a few gold each round. Doing this will either negate Axe’s strengths early on, allowing you to get a foothold to strike back with your own deck, or it will force your opponent to spend extra resources and mana on removing your blocking creeps, which undermines the whole reason to have Axe in the first place. Ultimately, Axe’s deployment is only strong because he can be left alone while resources are sent to other lanes, so by forcing your opponent to react to your blocking creeps, you can regain some control of the early game and balance the scales back in your favor. 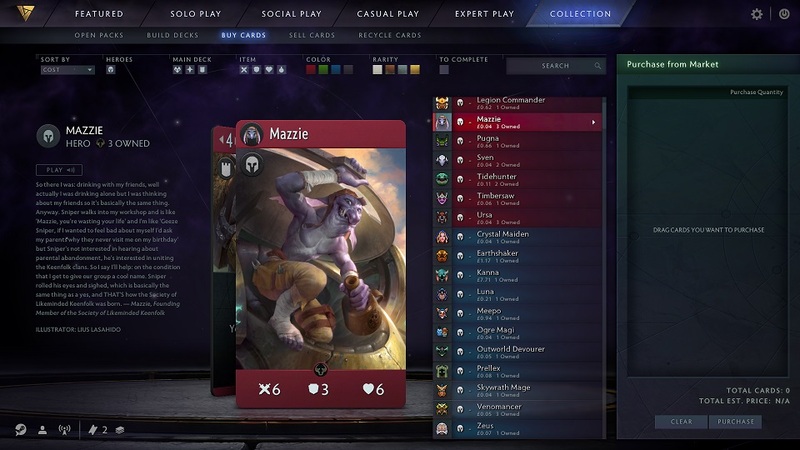 Whether you like it or not, the pricing model for Artifact is here to stay for the foreseeable future, and even the luckiest of people will eventually have to look towards either obtaining new card packs or purchasing cards directly from the marketplace after opening their ten introductory Call To Arms packs. The problem is that opening card packs leaves everything up to chance, and there’s no telling that you won’t just end up with a series of duplicate cards that don’t help you at all. To combat this, if you’ve got a deck in mind but you’re missing a few of the key components, then it can be much more economical to purchase the specific cards directly from the Steam marketplace instead. Most cards have already plummeted towards the minimum price so it can be quite inexpensive to fill gaps here and there, with the exception of some specific high profile cards that are currently seen to be important to the current meta builds. 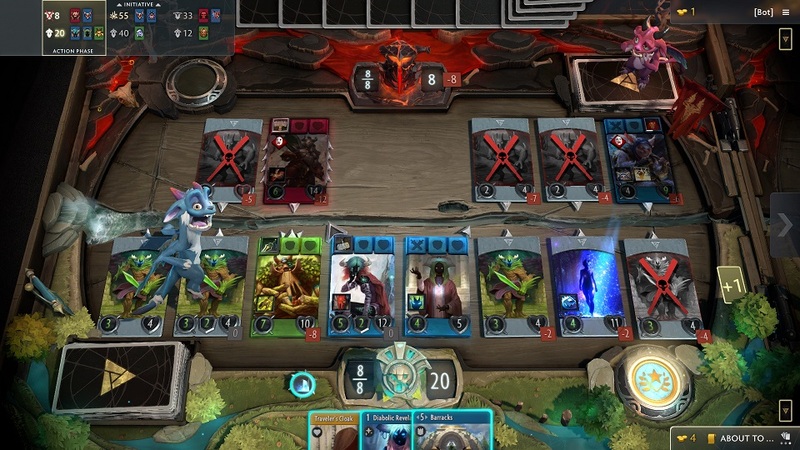 The Modify effect in Artifact can be a powerful tool that lets you permanently buff the affected units with any number of stat boosts and contextual effects. When used correctly, cards that modify themselves or other units can easily turn the tide of a lane, and their long lasting effects will carry forward for the rest of the match, even persisting through death. What’s more, these effects can stack on top of each other additively, allowing you to create some interesting and deadly combinations. A good example of this in action is when using Necrophos’s signature card Heartstopper Aura. This unique Black deck card allows you to modify a Black hero with an effect that deals two piercing damage to that unit’s enemy neighbors before the action phase. By applying this modifier multiple times on the same hero, you could potentially make it so that the modified unit deals six piercing damage to up to three potential enemies opposite it before the lane even starts. With a few health-boosting items added on top to keep the modified unit alive, stacking an effect like this is a great way to control a lane passively while spending your tower’s mana on more active cards. There are a number of other cards out there that have unique effects like this, and by stacking them together you can create a very powerful unit that is able to control an entire lane all by themselves. At the end of each round, both players are able to spend their hard earned gold on items from the shop, with three categories to choose from. There’s the Secret Shop, which is randomly generated from a specific list of high value items; the Item Deck, which is made up of items you equipped when constructing your deck; and Consumables, which are cheap items that are spent on use. While the latter two categories cycle through known items, the Secret Shop slot is randomly drawn each round and the item listed might not come up again if you don’t buy it when it appears. Luckily, you can do something to change that by using the hold button found just above the Secret Shop item card in the shop menu. By spending one gold this round, you can pay to keep the item there until the next time the shop appears, giving you time to try and earn the remaining gold needed to purchase it. This can be done indefinitely, providing you pay the one gold cost each round, and is a great way to keep a potentially game-winning item available until you’re able to afford it. 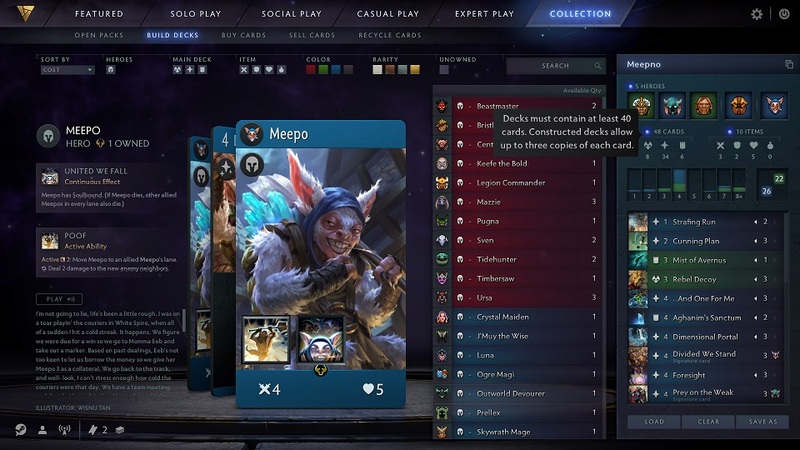 A single deck in Artifact must have at least 40 cards and nine items before it becomes playable, but it cannot exceed more than a total of 159 cards and 132 items. There’s a wide gulf between the minimum and maximum limits, and while it might be tempting to slot as much as you can into your deck to give yourself plenty of options during a match, by doing this you significantly reduce your chances of drawing a set of cards that work well together during the game. It’s unlikely you’re going to be able to draw and play the majority of a larger deck, so creating a swollen deck leaves you at a strong disadvantage against your opponent as they will likely draw the cards that they can play that synergize well together while your own hand is left up to chance. When building your decks you should try to minimize anything that could be left up to chance, as this will make your drawn cards much more reliable and effective. There’s no harm in going a few cards over the 40 card minimum if there’s a worthwhile benefit to having those cards in your rotation, but don’t equip them if you’re just doing it to make your deck more versatile. Unless there’s a specific set of opposing decks you want to counter, most created decks benefit much more from being focused on a singular goal rather than trying to play the field as a jack of all trades setup.